Arm in arm, looking smug! I hope you enjoyed my first poem of April for The National Poetry Month for the USA and Canada. 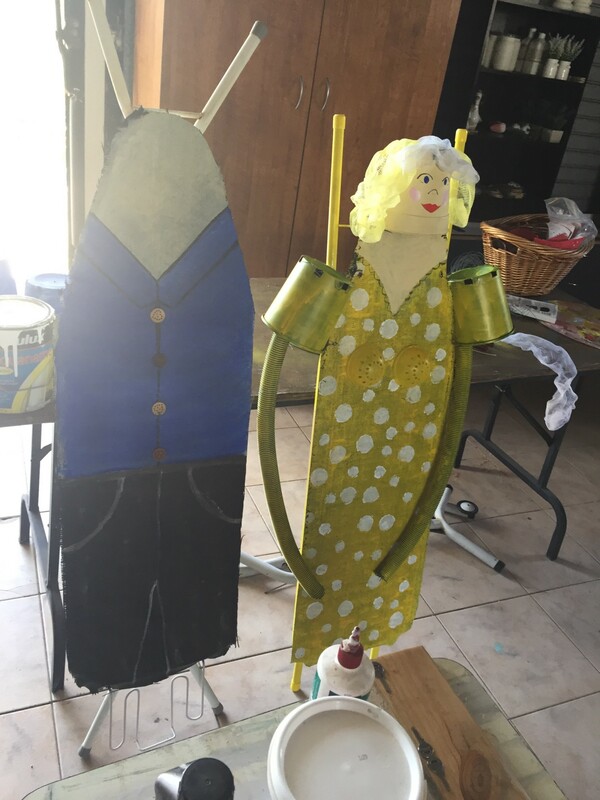 I made Brian and Gertrude out of two old rusty ironing boards I got for free at the dump. I glued and wired onto the ironing board some waterproof garden weed matt for material for Gertrude’s dress and then spray painted it yellow and added the white dots when it had dried. Two small plastic sieves were spray painted yellow for her bosoms, and I used hot glue to attach them. I had a small bamboo basket that I used to hold some old wooden painted tulip flowers that were slightly damaged that I had been going to throw away. I used some leftover bits of plastic extendable hose from a prior garden drainage job for both of their arms and attached them with zip ties behind the ironing board. Old black plastic plant pots were used for both of their sleeves and also for their heads. I used a large plastic dinner plate with a dessert plate glued on top for Gertrude’s hat and a real discarded hat for Brian. Brian’s hair was steel wool (normally used for scrubbing dirty pans) and I used two yellow plastic dishwasher scrubbers made out of unraveled netting for Gertrude’s hair. Brian’s clothes were painted on the ironing board with leftover paint. Then we attached them with zip ties to the shed wall and set them up in the garden to look out over the plant bed. 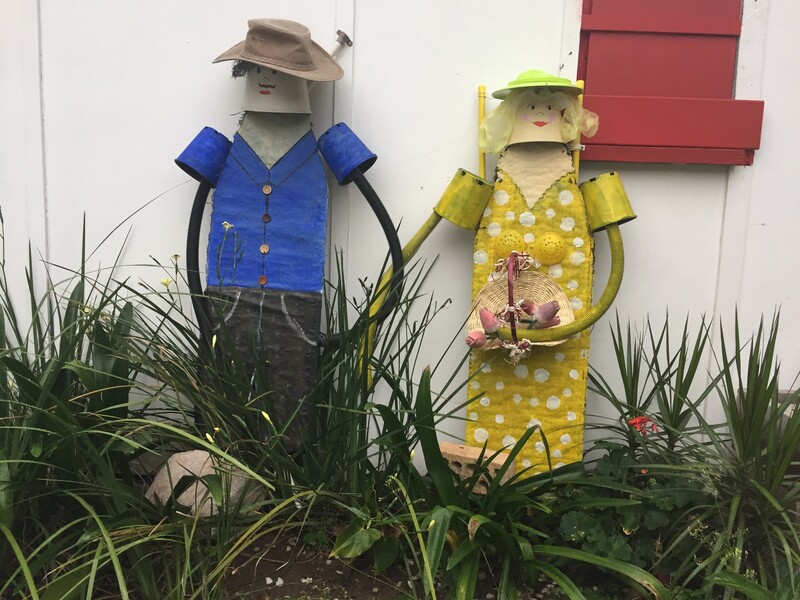 Making the garden people out of old ironing boards was a fun way to use up discarded materials and add some humor and color into our garden and be creative at the same time. Deborah Christensen is a writer, artist, and published author. She currently lives in Queensland, Australia. She lives with her husband, a rescue dog named ‘Lily’ and has six adult children (and one amazing grandchild) who live scattered throughout Queensland. She’s on Twitter @Deborah37035395 and Pinterest and is the author of the best selling and Readers Favorite 2014 award-winning memoir Inside/Outside: One Woman’s Recovery From Abuse and a Religious Cult.